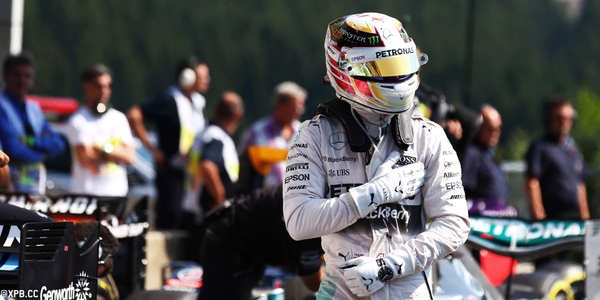 Hamilton untouchable in charge to Belgian Grand Prix victory. As expected, the new starting procedures mixed things up off the line, with Rosberg and Bottas making poor getaways from P2 and P3 on the grid, as Perez (starting P4) and Red Bull’s Daniel Ricciardo (P5) capitalised to chase polesitter Hamilton out of the first turn. It wasn’t until the first round of stops that Rosberg was able to get back on terms with Hamilton, moving up to second using sheer pace rather than passing, and when the Virtual Safety Car was deployed on lap 21 to remove Ricciardo’s broken-down Red Bull the gap was barely two seconds. From there, however, Hamilton had things in hand and the real battle was for third, with Grosjean pushing Vettel hard in the closing stages, only for the German’s right-rear tyre to let go in dramatic fashion approaching Les Combes with less than two laps remaining. 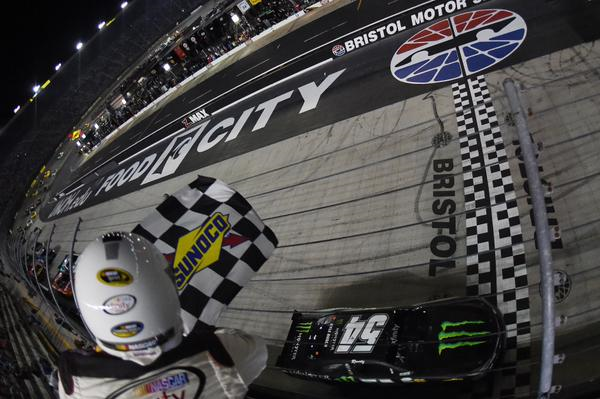 Joey Logano held off the reigning NASCAR Sprint Cup Series (NSCS) champion and current points leader, Kevin Harvick, by 0.220 seconds to win Saturday night’s IRWIN Tools Night Race at Bristol Motor Speedway. Following Logano and Harvick to the drop of the checkered flag were pole-sitter Denny Hamlin finishing third, Jimmie Johnson fourth and Clint Bowyer finished fifth. Rounding out the top-10 finishing positions were Brad Keselowski claiming sixth-place, Carl Edwards seventh, Kyle Busch (led the most laps – 192 out of 500) eighth, Dale Earnhardt Jr. ninth and Ryan Newman brought home 10th-place. 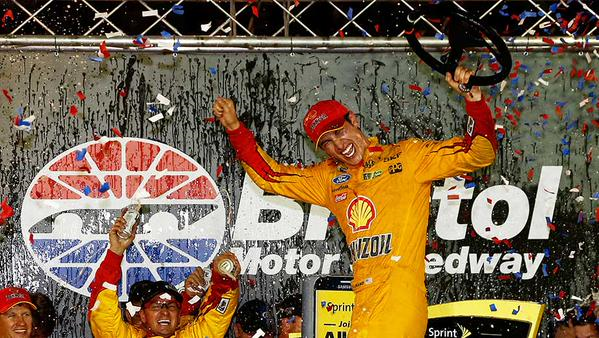 With his second-place finish, Kevin Harvick leaves Bristol with a 43-point lead over tonight’s winner, Joey Logano. Time of Race: 02 Hrs, 45 Mins, 05 Secs. 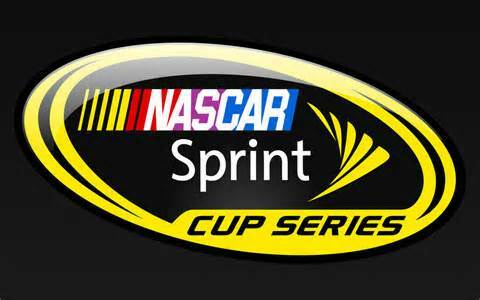 Up Next: The series takes their final “off-weekend” of season this coming weekend, and they return to action on Sunday, September 6th, at Darlington Raceway for the Bojangles’ Southern 500. 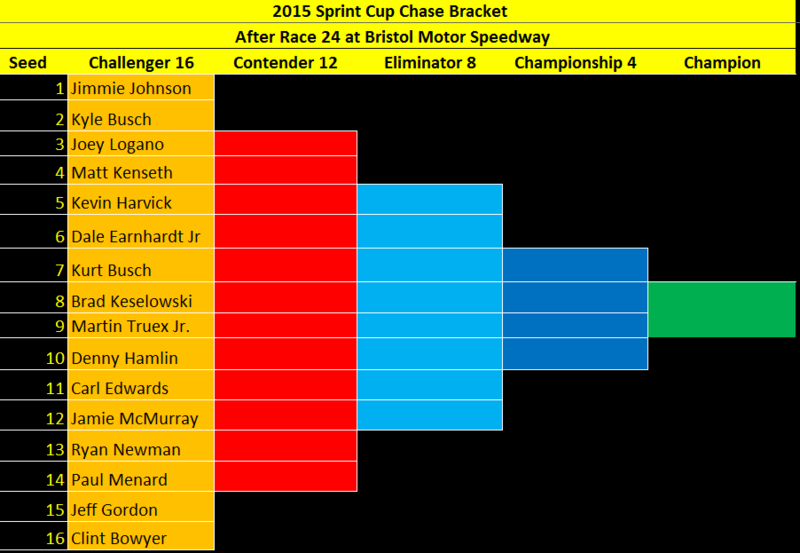 The race is scheduled to get started around 7:20 p.m. (ET) on NBC. The first part of qualifying had offered an ominous sign of Mercedes’ advantage, as Hamilton led Rosberg on 1m 48.908s to 1m 48.923s despite both using Pirelli’s medium tyre, which has proved around 1.5s slower than the softs the rest of the field used. Perez was at least right with the Mercedes pair on 1m 49.006s, while a late-improving Bottas worked his way into fourth on 1m 49.026s. The Finn had been in the drop zone until his late breakthrough, and his improvement therefore demoted Sauber’s Felipe Nasr into 16th – the Brazilian eliminated despite setting a 1m 49.952s, within 1.1s of Hamilton’s benchmark. Behind Nasr, Jenson Button beat Fernando Alonso at McLaren, with 1m 50.978s to 1m 51.420s for 17th and 18th. Both cars have had further engine changes for the weekend, though they won’t influence further the team’s back-of-the-grid starting positions that have already been mandated by the stewards. Rosberg got back on top in Q2, pipping Hamilton’s 1m 48.024s with 1m 47.955s, and they opened the gap to their pursuers – Vettel for example was third with 1m 48.761s. There was bad news for the Scuderia, however, as Raikkonen came to a halt without completing a lap. While Perez was fourth, Force India team mate Nico Hulkenberg dropped out in 11th place on 1m 49.121s, as did Red Bull’s Daniil Kvyat on 1m 49.228s. Less surprising was Marcus Ericsson in 13th on 1m 49.586s for Sauber. In the second Toro Rosso Max Verstappen opted not to run, preferring instead to save a set of tyres given his impending 10-place grid drop, while Raikkonen was left in 15th. Into Q3, and Hamilton’s first flyer gave him a resounding early advantage as he clocked 1m 47.449s to Rosberg’s 1m 47.895s. The German had made a fist of the second sector, however, which meant he had potential time in hand… Bottas got closest to the two Silver Arrows with 1m 48.567s ahead of Massa on 1m 48.937s, but Vettel was a disappointing fifth on 1m 49.698s. Rosberg and Hamilton were neck and neck through the first sector of their second runs, but Hamilton was simply irresistible over the rest of the lap and improved to a magnificent 1m 47.197s. 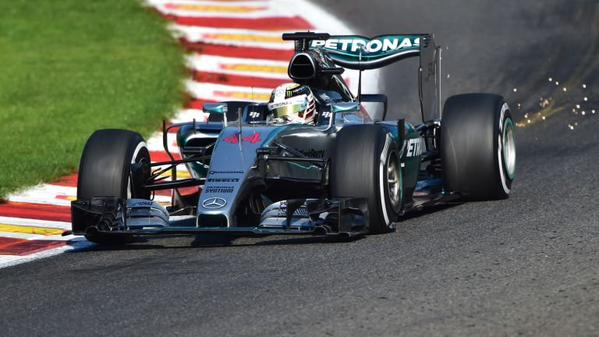 Rosberg improved too, but was firmly in his team mate’s shadow with 1m 47.655s. Grid penalty: Grosjean (5 spots – Gearbox Change), Verstappen (10 spots – Engine Change), Button and Alonso (back of grid for Engine Change). After seeing his team mate lead the way on Friday, it was Lewis Hamilton’s turn to top the times for Mercedes in Saturday morning’s final practice at Spa-Francorchamps. The world champion lapped the famous circuit half a second quicker than Nico Rosberg, with Sebastian Vettel third fastest for Ferrari. Vettel’s best was 0.6s down on Hamilton, and the German was backed up by newly re-signed team mate Kimi Raikkonen in fourth. Sergio Perez took fifth for Force India, followed by the Red Bulls of Daniel Ricciardo and Daniil Kvyat, and team mate Nico Hulkenberg. Williams’ Valtteri Bottas and Felipe Massa completed the top ten. It proved to be a tough session for McLaren, who already face the prospect of starting from the back of the grid due to penalties. Fernando Alonso failed to set a time and managed just one lap thanks to suspected exhaust problems, while team mate Jenson Button finished 17th, trailed only by the two Marussias. It was Red Bull who led the switch onto the faster, soft tyres, and Ricciardo and Kvyat duly hit the front, posting 1m 49.930s and 1m 49.980s respectively. Max Verstappen also elected to make an early change for the yellow-marked rubber, and for a time occupied third for Toro Rosso on 1m 50.599s. At that stage Hamilton was the fastest runner on mediums with 1m 50.635s, before Vettel fired a shot across Mercedes’ bows with 1m 50.460s. That left the order Ricciardo, Kvyat, Vettel, Verstappen, Hamilton, Raikkonen (1m 50.707s) and Rosberg (1m 50.821s) going into the final 10 minutes. But that’s when the serious stuff happened. First Rosberg clocked 1m 49.482s on softs, but Hamilton immediately smashed that with 1m 48.984s to move ahead of his team mate for the first time this weekend. Vettel jumped to third with 1m 49.629s, while Raikkonen slotted into fourth with 1m 49.864s, which came in spite of traffic. The Finn then set the best sector one time, but promptly lost a second and a half to Hamilton in sector two; Vettel, meanwhile, was also pushing hard enough to run wide at Les Combes. Neither went quicker. Perez very nearly ousted Raikkonen with 1m 49.866s, which was good enough to demote Ricciardo and Kvyat, whose focus had turned to long runs. Hulkenberg, meanwhile, jumped up to eighth with a very neat lap of 1m 50.000s, which left him a few tenths clear of Bottas and Massa. The Williams pair only really got going in the final 20 minutes of the session, and managed 1m 50.179s and 1m 50.447s respectively. Carlos Sainz ended up Toro Rosso’s faster runner, in part because Verstappen had switched to his own long-run simulation on the softs. 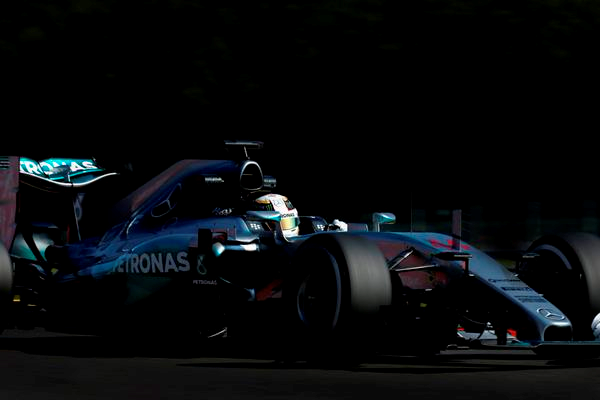 The Spaniard posted 1m 50.552s for 11th, ahead of Lotus’s Pastor Maldonado on 1m 50.585s. Verstappen was up next, with Felipe Nasr in the lead Sauber one spot further back in 14th, on 1m 50.690s. Marcus Ericsson took the sister C34 round in 1m 51.054s to head Romain Grosjean on 1m 51.187s for Lotus and Button who couldn’t better 1m 51.981s in the McLaren. That left the closely matched Marussias of Will Stevens and Roberto Merhi 18th and 19th, on 1m 54.262s and 1m 54.281s respectively. There were several minor offs and spins during the session, while Pirelli also confirmed mid-way through the hour that overnight investigations into Rosberg’s tyre failure in FP2 had revealed ‘no structural integrity issue,’ pointing instead to an external cut being the cause of the incident. Nico Rosberg continued to head Mercedes team mate Lewis Hamilton in this afternoon’s second free practice session at Spa-Francorchamps, but the German’s session ended early after a very scary high-speed rear tyre failure. The incident happened just over an hour into the 90 minute session and left an unhurt Rosberg stranded on the approach to Blanchimont, having luckily avoided the barriers after his right-rear Pirelli let go. 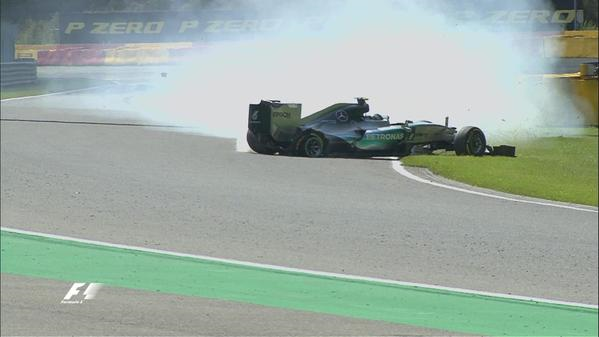 Marcus Ericsson was less fortunate. The Sauber driver brought the red flags out again in the session’s closing stages as he lost control at Pouhon, swiping the front-left corner of his car against the wall. The Swede emerged unscathed. Third in the times behind the two Mercedes was Red Bull’s Daniel Ricciardo, seven-tenths down on Rosberg’s best, followed by team mate Daniil Kvyat. Next up was the Ferrari of Kimi Raikkonen, the Force India of Nico Hulkenberg, and the Lotus of Romain Grosjean. Completing the top ten were Ericsson, Sauber team mate Felipe Nasr, and Sebastian Vettel in the second Ferrari. It was Rosberg who had set the pace on the medium tyres, and he maintained his momentum after the field switched onto the soft tyre, cutting down to a 1m 49.385s. Hamilton was in his shadow, but was half a second down on the mediums and three tenths down on the softs, posting a best of 1m 49.687s. He was also troubled at points by poor downshifts. Rosberg then switched onto a longer run on the softs, and had completed 11 laps when, barrelling into Blanchimont, his right rear gave way. Once again the two Red Bulls were in play, suggesting that they have indeed made a lot of progress with the RB11’s chassis and aerodynamics. Ricciardo was third with 1m 50.136s, while Kvyat backed him solidly with 1m 50.399s. Later, however, the Australian voiced suspicions that his engine felt like it was about to break. Ferrari’s best runner was Raikkonen on 1m 50.461s, a time later matched by Hulkenberg, while Grosjean ended up seventh on 1m 50.489s. The Frenchman, however, is being investigated for impeding Hulkenberg early in the session. Right at the end, Grosjean rolled to a halt and was stranded on track with power loss. Ericsson had earlier been temporarily fastest when he switched to the softs, before Rosberg restored the status quo. He held on to an encouraging eighth with 1m 50.709s ahead of team mate Nasr on 1m 50.928s, both revelling in the performance of the upgraded Ferrari power units which are to the specification Ferrari themselves had several races ago. The Brazilian had a scare when Kvyat was released right into his path in the pits, another incident the stewards are investigating. Vettel finished the session a subdued 10th on 1m 50.940s, with Sergio Perez in the second Force India right behind on 1m 50.971s. The Mexican went fastest in sector one for a while, but had to go round Felipe Massa’s Williams heading down to Pouhon, which didn’t help his lap. Toro Rosso weren’t as fast as they had been in the morning, relatively speaking, with Carlos Sainz this time easing ahead of Max Verstappen, 1m 51.037s to 1m 51.117s. Valtteri Bottas was next on 1m 51.250s after a rear wing endplate was changed, and Pastor Maldonado wheeled his rebuilt Lotus round in 1m 51.317s for 15th ahead of Massa on 1m 51.588s. One has to assume that Williams were majoring on race work, as they did in Hungary. It was another disappointing outing for McLaren; both drivers were using the Mk3 version of the Japanese engine, but Button’s best of 1m 51.854s was well away from where Honda had expected to be. Alonso was behind him on 1m 52.570s, having spoiled a faster lap by locking up badly going into the Bus Stop chicane. With all of their various component replacements and engine changes, the two of them face respective grid penalties of 25 and 30 places. Will Stevens continued to lead the inter-team Marussia fight with 1m 54.065s, but Roberto Merhi was on his tail with 1m 54.253s.